The customer, a prestigious technical research institute required AABSyS to prepare digital topographic maps of two districts in Romania. The company required AABSyS to use digital geographic information of the region to create 3D models and analysis of effects of earthquakes and other influences on the region. The customer possess satellite images of adjacent land areas in 1:30,000 scale and in TIFF format. The satellite images of adjacent land areas (Scale: 1:30,000) were merged, grey scale adjusted and different land cover types were classified. The team at AABSyS created an ortho-photo (composite image) from four satellite images (in TIFF format). The four images were merged with a minimum loss of contrast, the grey scale was adjusted and minor mismatched at the edges were fine-tuned. The same gray scale was maintained across the composite image so that different land types such as forest, agriculture, urban are easily distinguishable. Different land cover types were classified such as forests, urban and rural settlements, highways, main roads, side roads, buildings, rivers, trenches, railway tracks, TV towers, windmills, electric lines, trees, parks, fields, cultivated lands. Different land classifications were shown as area objects in different polygons. The work was performed using ERDAS Imagery software. The ortho-photo image was delivered in TIFF format, and the vectorised land classification file was delivered in ArcView SHP format and AutoCAD DXF format. The team used Heads up digitization conversion method. 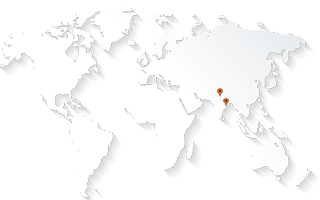 AABSyS has been providing of Orthophotography services to its clients worldwide for many years now. The client, a prestigious technical research institute used the ortho-photo provided by AABSyS in making informed decisions about the concerned area of land.